There is lots to love about the onset of fall... it's always been my favorite season in NYC. The added bonus of jeans and layers to cover "Yes, I'm blaming it on the baby" extra pounds agrees with me, what can I say. As a parent, though, the season starts to worry me a bit. Because beyond those gorgeous fall leaves and trips to the pumpkin patch, there are seemingly endless COLD months ahead. And the question of how to entertain the children and keep us all from getting cabin fever abounds. Thank goodness for places like the New York Kids Club. A few weeks ago, I was invited to an afternoon of play and classes at their space on 22nd Street by MamaDrama Consulting. I brought Baby Sister with me and it was such a special afternoon... we haven't had a lot of quality time just the two of us, so I appreciated having an excuse to take the day off and enjoy some Mommy and Me time with her. Cuentos Musica y Arte: a Spanish immersion class for ages 18-36 months, which encompasses music, storytelling, art and play. The instructors were friendly and engaging, and the class was conducted entirely in Spanish. Ole! 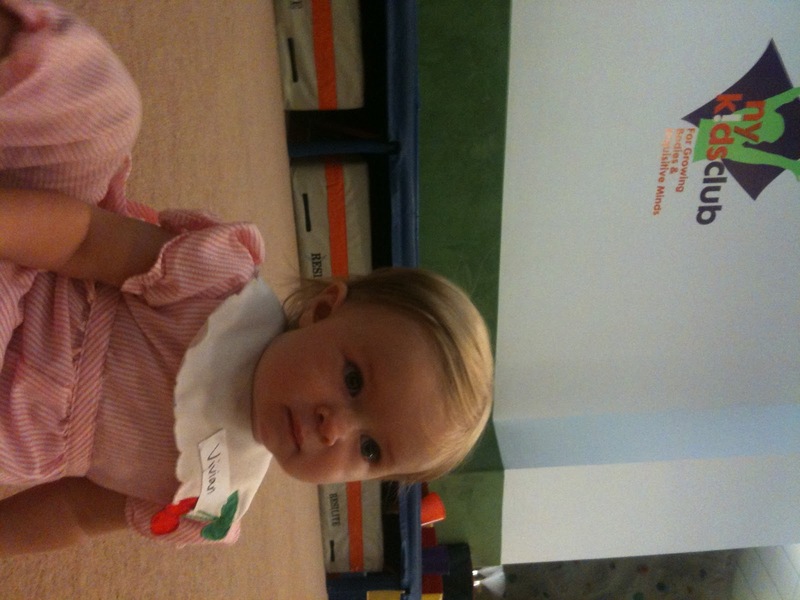 Infant Milestones: How I wish I'd known about this one when my girls were brand new! This class centers around the developmental patterns of infants through music, movement, tummy time and gentle massage, and the supportive environment is as much an asset for new babies as it is their mamas. 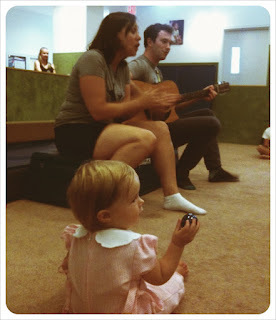 Musical Tots: Baby Sister hit the jackpot with this one -- she loves music, and this class is perfect for her age group (0-24 mos). This class takes your favorite songs and nursery rhymes and keeps them upbeat and fun, led by a guitar-playing and singing duo that might be trying out for Broadway on their off-time. Lotsa fun! It was a perfect afternoon with my little gal, and I owe that all to the generous and loving staff at the New York Kids Club. Such a positive environment for our growing kiddies; I encourage you to check out their offerings! Disclaimer: As mentioned, I was invited by MamaDrama Consulting for an afternoon of play. All opinions expressed are my own. Always nice to take some alone time with one of the kids - good for you!